The North Rim Loop Trail starts right at the Skier's Camp front door. 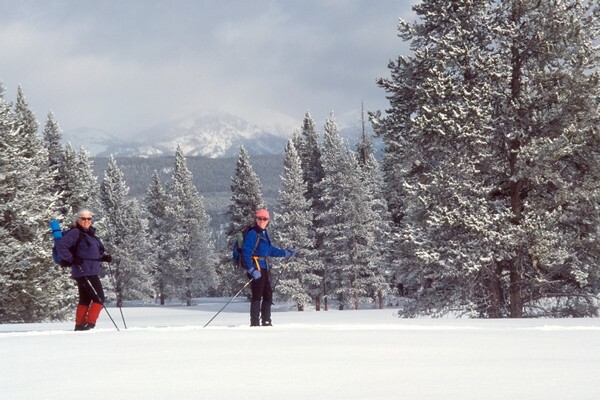 We can ski a 10 to 16 kilometer (6 to 10 mile) loop along the North Rim of the Grand Canyon of the Yellowstone River. This loop trail follows the edge of the Canyon and provides spectacular views of the canyon and falls of the Yellowstone. On the longer version of this route, you will also get some pretty nice views across the Canyon of Silver Cord Cascade (600 feet high), as well as additional views down the Canyon. The trailhead for the Forest Hot Springs Trail is located on the South Rim of the Grand Canyon of the Yellowstone, a 3 mile snowcoach ride from the Yurt Camp. It is a very scenic 2.5 kilometers (1.5 mile) ski across the northeast side of Hayden Valley into the hot springs basin. Forest Hot Springs is an acidic basin with lots of boiling mudpots and some colorful sulfur rich pools. Fresh snowfall caps the rocks in the basin and turns the area into "The Land of the Mushrooms". Bison are also usually seen along the way. Several loop options are available for returning to the snow-van. Some of the various return trail options will take us along the South Rim of the Grand Canyon (Easier, More Difficult, or Most Difficult -You pick the return option) providing exceptional views of the Lower Falls (94 meters / 308 feet high) and Upper Falls (33 meters / 109 feet high) of the Yellowstone River. The starting point for the Dunraven Pass trail is located at the very end of the snow-van road 7 kilometers (4.5 miles) north of the Skier's Camp. From the trailhead at Washburn Hot Springs Overlook, we usually ski 2.5 kilometers (1.5 miles) up to Dunraven Pass. Due south 120 kilometers (75 miles) the Teton Mountain Range of Grand Teton National Park rises up and looks almost within touching distance. 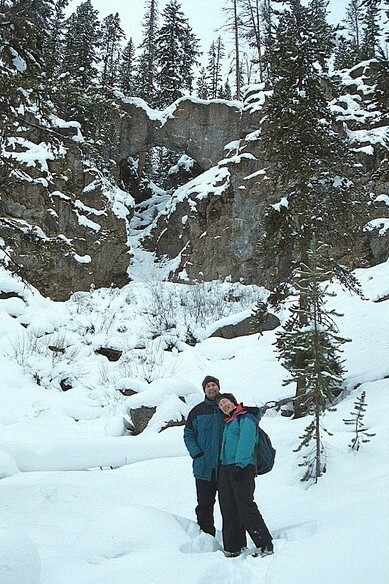 We usually loop back to the snow-van by taking a side trip to the Washburn Hot Spring Basin (West Portion). The Cascade Lake Trail starts from the front door of the Skier's Yurt Camp. This fairly level trail heads west along Cascade Creek and through several meadows to Cascade Lake. The length can be varied from 8 to 16 km (5 to 10 miles) round trip. Good views of the Washburn Range can be had from the midway point along cascade meadows, and usually we see a bison or two along the way. The destination of Cascade Lake and the surrounding Cascade Hills (More Difficult) are good places to try out telemarking for the first time. These two short trails in the Yellowstone Lake Area (plan on skiing both trails) start from a trailhead located 25 kilometers (16 miles) south of the camp, along the "Canyon to Lake" road. It takes a little longer to get to these trail heads, but the snow-van trip is worth it. The snow-van trip takes us through Hayden Valley, a 13 kilometer (8 mile) wide by 20 kilometer (12 mile) long open meadow, which often has bison grazing on the banks of the (frozen) Yellowstone River. We may also see coyotes in the meadows, trumpeter swans, goldeneye ducks and bald eagles near thermally warmed waters, and maybe an otter or two in the Yellowstone River rapids. The Yellowstone Lake - Gull Point Trail is a level trail along the edge of Yellowstone Lake that is about 4 km (2 1/2 miles) long. The view of the mountains across the frozen lake is spectacular. The Natural Bridge Trail is a 4 kilometer (2 1/2 mile) long trail that ends at a natural rock bridge spanning a branch of, you guessed it, Bridge Creek.